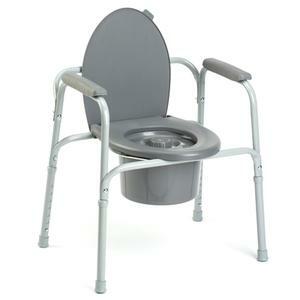 The Invacare All-In-One Steel Commode from IndeMedical.com offers a 16" wide seat for increased comfort, stability and support. 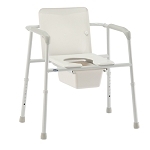 The steel commode can be used bed side or simply remove the back and use it as a toilet safety frame or raised toilet seat. 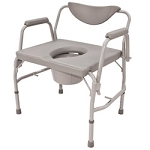 This commode has a 300 lbs weight capacity and this model comes in a single pack. Seat Width: Surface: 16" Inside: 8-1/2"
Seat To Floor Height:16" - 22"